Dan J. Marlowe's fans will quickly point to 'Earl Drake' as the author's finest work. 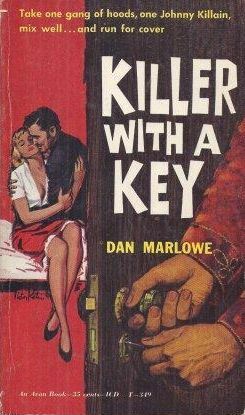 However, before creating that 60s-70s series, Marlowe had a five-book run of hotel detective novels starring protagonist 'Johnny Killain'. The first, “Doorway to Death”, released in 1957 via Avon, followed by this sequel, “Killer with a Key”, the same year. Killain's detective work runs parallel with the night shift duties at Hotel Duarte, an older establishment in New York City. The series debut convinced readers that Killain is the real deal – a no nonsense, tough guy that worked for the pre-cursor of the CIA during WWII. So, when Killain's ex-wife, Ellen Saxon, is found murdered in his hotel...we know heads will roll. The novel's narrative has Killain rescue his ex-wife from a hail of bullets. After physically ripping a car door handle off in the firefight, Killain manages to hide Ellen in a hotel suite. It's only a matter of time before Killain finds her strangled to death on the bed. The culprit points to Killain's friend and co-worker Vic, but Vic may be taking the heat for another party. What Marlowe perfected in the series debut was the interplay between hot-headed Killain and the NYPD. Here, it is duplicated in the same fashion with equally entertaining results. While Detective Cuneo runs afoul of Killain's private investigation, he needs Killain to do the dirty work his department won't allow. The narrative follows Killain's hardboiled trail as he navigates an underworld of insurance rackets. The murder puts him at odds with not only the police, but friends and allies that may be involved in running a fraudulent business out of the hotel. While not as action-packed as Marlowe's Earl Drake, this series more than makes up for it with the lovable cast of characters. The hotel's staff, including Killain's lover, enhances the story with familiar faces that plays like an episode of “Cheers”. The heart of this story and series is Johnny Killain – the smart, loud, fist-fighting man's man. And, as billed, Marlowe is exceptional. This one is a recommended read for crime novel enthusiasts.